INSEAD has just launched its entirely revamped website and extensive online offering. 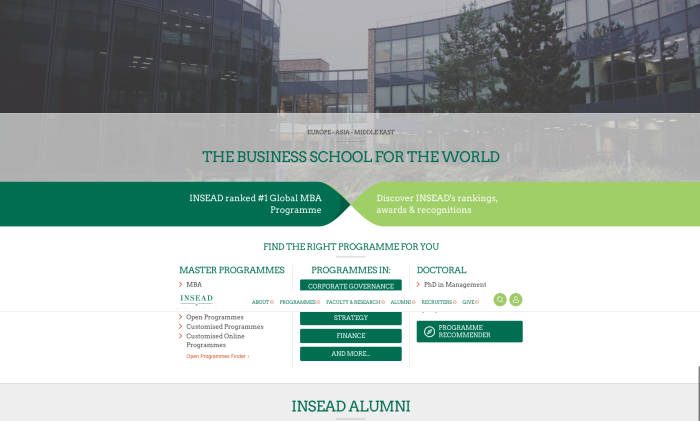 With over 20,000 viewers a day, INSEAD’s most visited campus is online. While INSEAD prides itself on being one of the most forward thinking business schools globally, they recognised the need for this ‘forth (digital) campus’ to become a true reflection of the INSEAD experience, and drive top-of- mind awareness amongst prospective students, alumni, corporate partners, and employers. This led INSEAD to rethink its entire digital engagement strategy, starting with its website. VML Singapore was appointed as the digital partner for INSEAD. The agency worked closely with the various internal stakeholders across departments, including corporate communications, digital, program management and the degree program team, to collaboratively define the digital vision for INSEAD. Starting with digital transformation workshops, user-centric design studies, stakeholder interviews and consumer research, and following through to the user experience design and platform development Tailored to the needs of each audience group, the website provides visitors with an interactive, responsive and personalised experience, bringing to life what being ‘The Business School for the World’. On the back end, the new portal was built on Drupal’s CMS – pushing the boundaries of what the technology can provide, to create a cutting edge platform experience, around the core pillars of personalisation, segmentation, and a modular approach to content and functionalities. By integrating the platform with social networks, the platform allows prospective students to get recommendations on what programs offered at INSEAD would provide a best fit for their needs and skill sets, based on their LinkedIn profile and interests shared. The platform allows logged in users to seamlessly track previous actions, such as application status, find bookmarked/ favourite content, and via a four-level content hierarchy with mega menus, ensures that no matter which audience segment you fall under, you can find relevant content in six clicks or less.